Beyond key ecological services, marine resources are crucial for human food security and socio-economical sustainability. Among them, shellfish aquaculture and fishing are of primary importance but become more vulnerable under anthropogenic pressure, as evidenced by reported mass mortality events linked to global changes such as ocean warming and acidification, chemical contamination, and diseases. Understanding climate-related risks is a vital objective for conservation strategies, ecosystems management and human health. 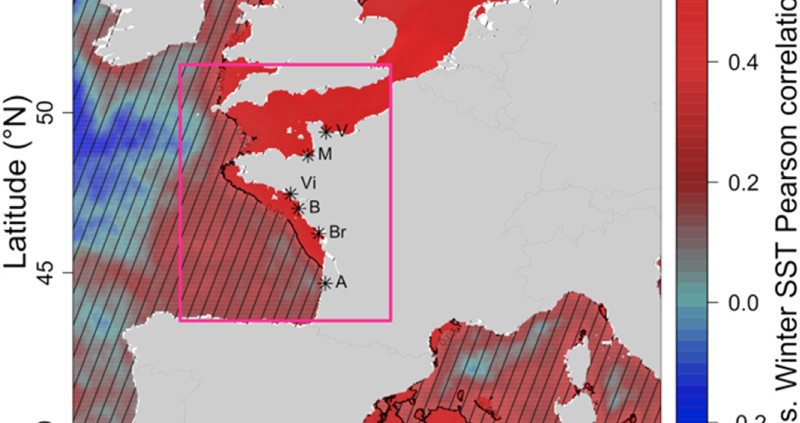 We provide here a comprehensive study of the historical mortality of adult oysters related to observed climate variability along the French Atlantic coast from 1986 to 2015, and we built on this knowledge to develop hindcast and forecast assessments of the oyster mortality risk from 1900 to 2100. We show that mortality events usually occur several months after winters dominated by the occurrence of positive North Atlantic oscillation (NAO+) atmospheric regimes of circulation. We explain the lagged response by the multiseasonal long-lasting imprint of wintertime NAO+ on biological and environmental factors, which partly structure oyster mortality etiology. 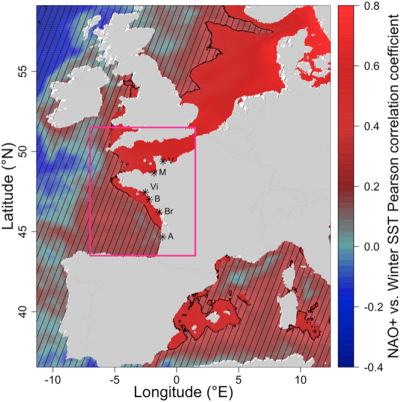 Very high wintertime seawater temperature anomalies at the interannual timescale, which were mostly attributable to internal climate variability through NAO+ and which led to pronounced mortality over the observed period, are then treated as ‘analogs’ in a large ensemble of Intergovernmental Panel on Climate Change emission scenarios and models in order to anticipate future risks. Without any adaptive process, we provide evidence that actual exceptional mortality is likely to become the norm by ~2035, even if global warming is limited to +2 °C relative to pre-industrial levels. Figure 1. Time series for December–March (DJFM) winter NAO+ occurrences and annual oyster mortality rate. (a) Location of the six monitored stations along the French Atlantic coast: Arcachon (A), Breton Sounds (Br), Bourgneuf (B), Vilaine (Vi), Mont Saint-Michel (M) and Veys (V). (b) Centroid of the NAO+ weather regime obtained from daily anomalous sea-level pressure from NCEP/NCAR reanalysis (see Methods). The box shows the region of interest. (c) interannual oyster mortality rate averaged over the six stations (in %, black dots) and cumulated number of NAO+ days per winter (red triangles). Grey shading represents the inter-site standard deviation. The correlation coefficient between the two time series is equal to 0.77 (P < 0.01 based on r-test). Thomas, Y., Cassou, C., Gernez, P., and Pouvreau, S. 2018. Oysters as sentinels of climate variability and climate change in coastal ecosystems. Environ. Res. Lett. 13(10): 104009. doi:10.1088/1748-9326/aae254.